It's accessible and affordable. You basically just need a good pair of sneakers and, if you're a lady, a really good sports bra. I like to tell myself that I also need top-of-the-line running clothes and accessories, but really you can skimp on those things if you need to. You don't need fancy equipment. You just go outside and run. The 2015 Boston winners both dropped out of past races, proving that anyone can have and come back from a bad day. Everyone hurts, no matter how fast or slow you are. This might apply to every other sport, but I like running because everyone hurts a little bit. I mean, my favorite runs are the ones that don't really hurt, but if you're going for it at a race, it's nice to know that while I'm hurting in the middle of the pack, the Olympians are hurting at the front of the pack. It's equalizing. Read this great post-race interview from Shalane Flanagan, the fastest current American marathoner and 9th place finisher at Boston. That zen life. Running can be so zen. It can also be totally crazy and intense. But if you settle into a comfortable pace on a nice little route, it's a form of meditation, I swear to it. And realizing that you just knocked out a meditation sesh and a run before work? That's the good stuff. And how about Meb?! What an inspiration and class act. First read this article that I found last year about his 2013 NYC Marathon, then read this post he wrote right before this year's Boston marathon, then look at this cute photo of his daughter's doing their homework while their dad preps for the race. You can read more about the #RWRunStreak here and follow along on Facebook, Twitter & Instagram with the hashtag. Happy Thanksgiving! Fall is a big time for us, especially this one. Our 30th birthdays, our first house, our second wedding anniversary... so much cause for celebration! I'll be back soon talking about turning 30 and resuming our little chat about neighborhoods and houses. Stay safe out there, snowpeople! I'd like to report back that I've been running strong through the winter. That I bought myself some new cold-weather running gear and have been hitting the streets, bundled up and tough as nails. That would, however, be a lie. Winter hits me hard and despite best intentions, I've only gotten outside for a run a handful of times this season. Because running outside in the bitter cold makes me feel sad. Sad and maybe a little hopeless? Yes, sure, afterwards I'm walking around all full of myself but I'm not sure it outweighs how sorry I feel when I'm out there and my lungs are burning, tears are stinging my eyes and I'm watching every step so I don't slip on ice. If it's a mild winter day, then maybe. I'll take advantage of a sunny Saturday in the 30s perhaps, but 7pm in the single digits? No, ma'am. I'd rather putz around downstairs with my weights, get on the yoga mat or even, if I'm desperate, hit the treadmill at the gym. In winters past, I'd get really into group fitness classes- kickboxing, BodyPump, Zumba or whathaveyou. I've phased out of that, but this winter we joined another gym for its indoor pool and I've been occasionally cutting a few laps there after work. Tricky business, swimming is. On the one hand it's great to be splashing around in a warm pool in January. On the other hand, you're in a bathing suit in public in January. 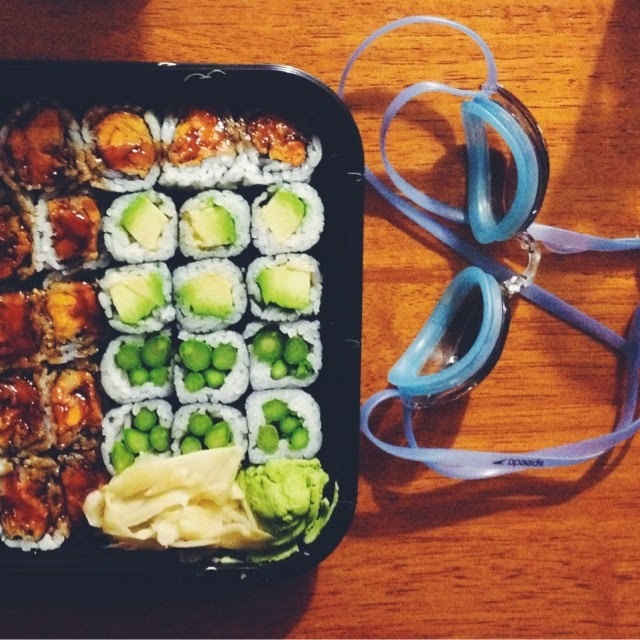 But afterwards we like to pick up some veggie rolls at the local sushi joint, so it's become a nice ritual. 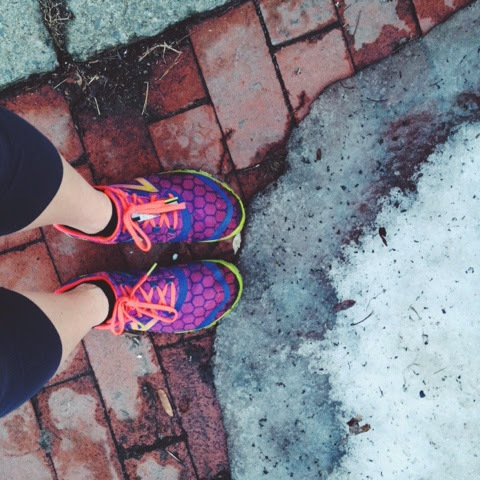 Despite the unwelcome snowy weather this week, we've been enjoying small bursts of spring lately and I'm finally starting to feel that itch to get back out in my running sneaks. Cruising around the city on foot and getting some Vitamin D. Crawling out of hibernation. It's a balance between pushing yourself out of your comfort zone and listening to your body. On getting out there for a run even when you don't want to... and respecting the internal changes that happen with the seasons. On deciding to push through or choosing to change your goals and expectations. For me, this winter, I didn't feel much like running outdoors. So for the most part, I didn't. Instead we snowshoed with friends-- including a full moon Adirondack adventure through the woods leading to bonfires with hoards of bundled-up snowshoers and skiers huddled around drinking beer and roasting 'mallows. I've stretched and danced and worked on building strength. I've snuggled and read a lot too. No need for shame to accompany that decision, right? The transition to winter is tough. Sometimes I like running for fun. I can't believe I trained for and ran a marathon! Ok, just get outside and run.